The practical design of the Model K0235 Flat Cell makes it simple and easy to use for corrosion and/or coatings research. It can accommodate a wide range of electrode sizes, eliminating the need for machining or special mechanical procedures. It disassembles quickly and easily, operates with a 250 mL sample volume and simplifies electrochemical corrosion measurements. The Flat Cell is constructed of a Pyrex™ glass cylinder body with polypropylene end caps. 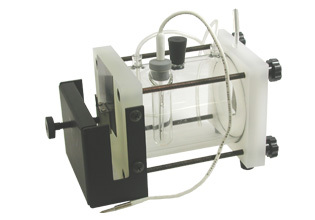 The Flat Cell's sample holder can accommodate test electrodes ranging from 3/4-in. (19-mm) diameter discs to 6 × 6-in. (152 × 152-mm) flat panels. In fact, virtually any size specimen can be used, provided it is flat and less than 3/8 in. (9.5 mm) thick.